I have always loved two things: Sedan Deliveries and El Caminos. So I guess it had to happen sooner or later since the Tom Daniel Bad Actor/Street Fighter kit is so easy to build. This one was produced with the Street Fighter Two kit and a little creative slicing, dicing, and shaping. The nice thing about this kit as opposed to other kits that you can make phantom Elkies into, is that this one already has a nice bed floor in it. The rest of the kit is built straight out of the box with a little wiring and painted Testors Black Pearl from a heated spray bomb with Testors High Gloss overcoat from a heated spray bomb. The interior is the same Black Pearl covered with Plasticote Classic Pearls Transparent Purpearl. 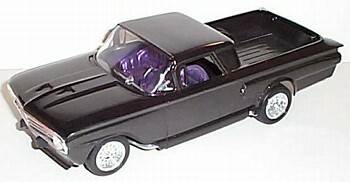 To date I have built 18 phantom El Caminos but this one is my all time favorite.